Oregon Ducks fans, and the entire College Football community as a whole, often talk about the greatness that Marcus Mariota is on the field. On the other hand, Mariota chooses to lead by example off the field, holding himself to standards of a role model. All records have been set, and one thing remains on the minds of Oregon Ducks fans – will Mariota be drafted No.1 in the 2015 NFL Draft? In the past 60 years, 14 Ducks have been selected in the first round, five of which were taken in the top ten. In 1955, former Oregon player George Shaw was taken with the No.1 overall pick by the Baltimore Colts. Mariota’s chance to become the second Oregon player taken No.1 overall in the NFL Draft very much depends on his performance at the combine over the next few days. For starters, Mariota is every GM’s off-the-field dream. He comes with no prior legal issues, something Florida State‘s Jameis Winston cannot say. Winston being the key subject in several very lengthy and serious investigations in college for various reasons sparks a red flag, being that Mariota’s worst publicity was when he got pulled over on his way back to Eugene for speeding. Nothing beats talent and hard work; having character and common sense to go along with that makes for a deadly combination at the next level. 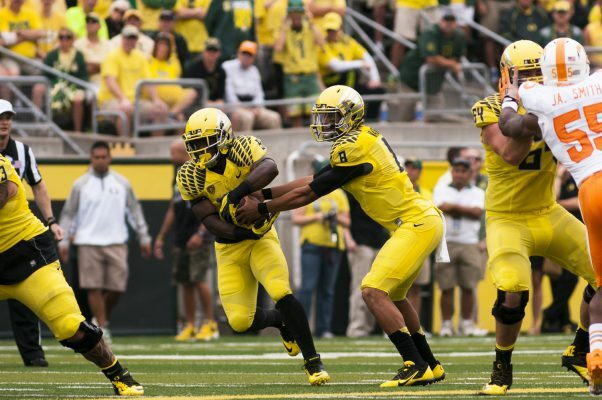 The biggest knock on Mariota is the offense that Head Coach Mark Helfrich runs at Oregon. The spread offense is one that requires a great mix of athleticism, throwing ability and knowledge to run efficiently – all characteristics that Mariota has. Unfortunately, the spread offense is not a common style ran in the NFL; this brings question to Mariota’s ability to have an immediate impact on the team that drafts him in a few months. Winston, coming from Florida State, has spent the last few years in a pro-style offense. On many draft boards, Winston is listed higher then Mariota, and this is the reason why. Winston’s experience with a pro-style offense in college allows for coaches and scouts to see exactly how he would fit into their system if they were to take a gamble and draft him. Mariota’s best chance for securing the No.1 pick in the draft is to have a stellar performance at the combine, following that up with a great performance at Oregon’s pro day on March 14th. It was reported that Mariota might not throw at the combine due to a shoulder sprain he suffered from a massive hit he took from Ohio State‘s Joey Bosa in the College Football Championship Game. Mariota has dispelled such rumors, saying he will throw at the combine. Winston has gone public, saying he is uncertain if he will throw at the combine. This allows for Mariota to show his worth, without having to compete against Winston. All in all, Mariota still has a great chance at being the No.1 pick in this year’s draft. Even if he slips down the board a little bit, it would be disappointing to see Winston taken before him. 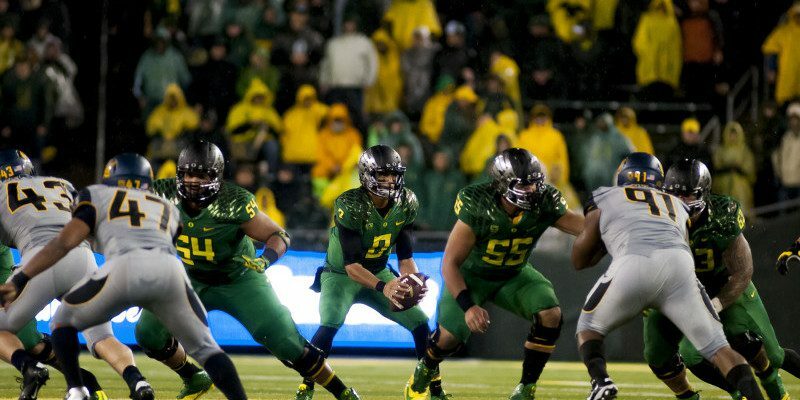 Mariota, quite possibly put together the greatest season of any quarterback in College Football history. It’s only fitting that the Heisman winning class act follows up such a campaign with being taken No. 1 overall in the draft. Stay tuned to find out.